The Taliban have been acquiring enemy weapons for years. But as US forces started withdrawing in 2011, they gained territory and seized increasing amounts of vehicles, guns, and other devices. Much of this gear was supplied by the US to Afghanistan’s military and then captured on the battlefield, or sold to the Taliban by corrupt Afghan officials. In 2015, Taliban were filmed riding American Humvees, which they have also used to ferry bombs. Propaganda images in 2017 showed Taliban fighters with US-made rifles and radios. Most concerning of all, reports started emerging of the Taliban using night-vision equipment and lasers. In a 2016 report, the UN cited Afghan officials who expressed serious concern that the Taliban were utilising high-tech lasers and night vision goggles. According to the New York Times, Taliban night attacks more than doubled between 2014 and 2017, and casualties from those attacks almost tripled, thanks to the group’s possession of night vision technology. In February of this year, the Taliban published a 30-minute propaganda film showcasing their capabilities. The video is filmed through a thermal night vision scope and shows Taliban fighters shooting illuminated Afghan soldiers. Night vision and laser aiming devices reportedly enabled the Taliban to wipe out an entire Afghan army company in March. In the past month, Taliban propaganda has repeatedly broadcast footage of US assault rifles and other equipment seized from Afghan forces in raids [the author thanks Mr Haris Walid for his translations of the relevant videos]. This is all part of a broader trend, which has seen American equipment fall into the hands of militant groups around the world. IS captured US gear supplied to the Syrian rebels, for example, while, more recently, Saudi and Emirati forces fighting in Yemen allegedly diverted US-made arms to Al Qaeda-linked militants. The US has been flooding the world with weapons, a process that began long before Trump took office, but has swiftly accelerated on his watch. According to official statistics, US arms sales to foreign governments rose by 33 percent from 2017-18. This is related to a shift in US strategy, which has moved away from large-scale troop deployments (such as the occupation of Iraq) to training and arming foreign militaries so they can better provide for their security. But this strategy can backfire when partner governments are corrupt and incompetent. A task force set up by the US Congress recently concluded that “by, with, and through” had been a failure and called for restrictions on American security assistance so that equipment did not fall into the hands of militant groups. Afghanistan is a case in point. Soldiers, starved of their wages by predatory commanders, have allegedly sold ammunition to the Taliban to make ends meet. Another report in April showed that American equipment transferred to Afghan forces in Paktika province was looted. The US cannot escape blame, either: SIGAR has revealed gross discrepancies in the databases maintained by the Department of Defense to track the weapons it provides to the Afghan government. And, as of 2018, there was no system in place to monitor US-made weapons obtained by the Taliban. However, reports of the Taliban using sophisticated equipment may be excessive. According to a new study by the journalist Franz J Marty, relying on opensource data and government information, the insurgents mainly use rifle-mounted night vision scopes intended for hunting that are inferior in quality to the military-grade gear possessed by Afghanistan’s security forces. These scopes are commercially available, likely obtained abroad and then smuggled into Afghanistan, the study claims. Allegations that Iran and Russia have supplied the Taliban with night vision devices are dubious. Even this inferior technology does benefit the Taliban, though, insofar as it enables fighters to see at night and attack government forces, but it is doubtful that the insurgents can use their devices effectively. Nevertheless, Afghan officials firmly believe that the Taliban possess superior technology to government forces. Marty reviewed a classified report by the National Directorate of Security (NDS), Afghanistan’s intelligence agency, which makes absurdly exaggerated claims about the Taliban’s capabilities. The real impact of Taliban night vision may, therefore, be psychological. Afghan forces are clearly convinced the Taliban have advanced equipment, which means they are more likely to abandon their positions and flee. Taliban propaganda may be responsible for this misconception. The 30-minute night vision video features relatively primitive equipment, but the footage of ghostly Afghan soldiers being spied on and shot at in the dark is creepy and disconcerting. The Taliban appear to be prioritising captured weapons in their video material: there have been multiple films in the past month alone showing rows of American rifles seized on the battlefield. The Afghan government has clearly swallowed this kind of material whole, convincing themselves the insurgents are much stronger than they are. While night vision gear and US assault rifles might give the Taliban a tactical boost, they are important first and foremost for their propaganda value. Indeed, these videos recycle a simple but effective formula commonly found in the group’s media productions, of heroic Taliban overwhelming a weak and corrupt Kabul administration that is a “puppet” of foreign “invaders”. 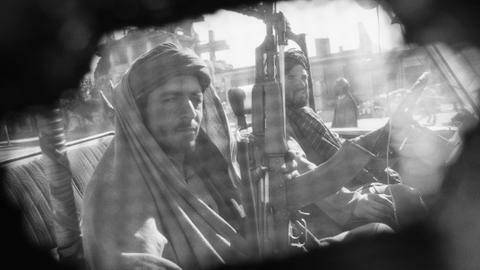 Films of captured American guns not only advertise the group’s battlefield victories and newly-acquired weaponry but expose the Afghan government’s inability to secure its own resources while implicitly affirming its dependence on US military equipment. As Thomas H Johnson shows in his classic study of Taliban propaganda, Taliban Narratives, this sort of message has been remarkably successful, achieving a political impact that rifles and night vision could never have. 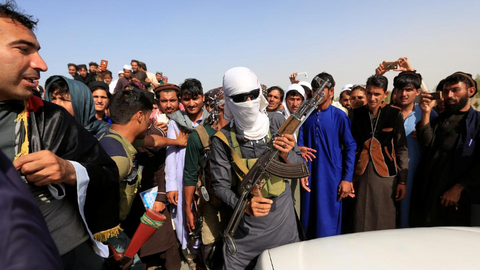 Media, not guns, is the Taliban’s lethal weapon.